Version 4 of Lepbase, the hub for Lepidopteran genomes, not only includes several new genome assemblies and annotations, but also showcases a re-engineered infrastructure that will enable other groups to easily set up their own Ensembl-based genome hubs in the future. The Heliconius melpomene genome assembly version remains the same (Hmel2), but the annotation has now been updated to include Braker 1.0 predictions based on several independently sequenced RNAseq libraries, in collaboration with Chris Jiggins’ lab. Manual annotations and old gene names have been retained where the overlap is unambiguous. Several new assembly-only species were also added to Lepbase v4. Although no gene prediction sets are available for these species, you can download the genome fasta files at download.lepbase.org/v4/sequence and do BLAST searches against them at blast.lepbase.org. Over 12,000 OrthoFinder clusters were processed into Gene Trees which can be accessed from their constituent gene pages in the Lepbase Ensembl browser. The goal of this analysis was to provide a context for each gene. However, as with all automated analyses, it may contain artifacts due to differences in gene prediction methods or due to generic parameters used in the pipeline. If you are interested in a highly accurate reconstruction of a specific gene family, you can download all the sequence and alignment data for a given gene and its homologues, and redo the tree using your preferred phylogenetic pipeline. The specific steps and evaluations for each part of our gene-tree pipeline will be described in forthcoming technical notes. One of the key features of Lepbase is that we provide consistent analyses across all genomes using the same software and database versions and parameters. 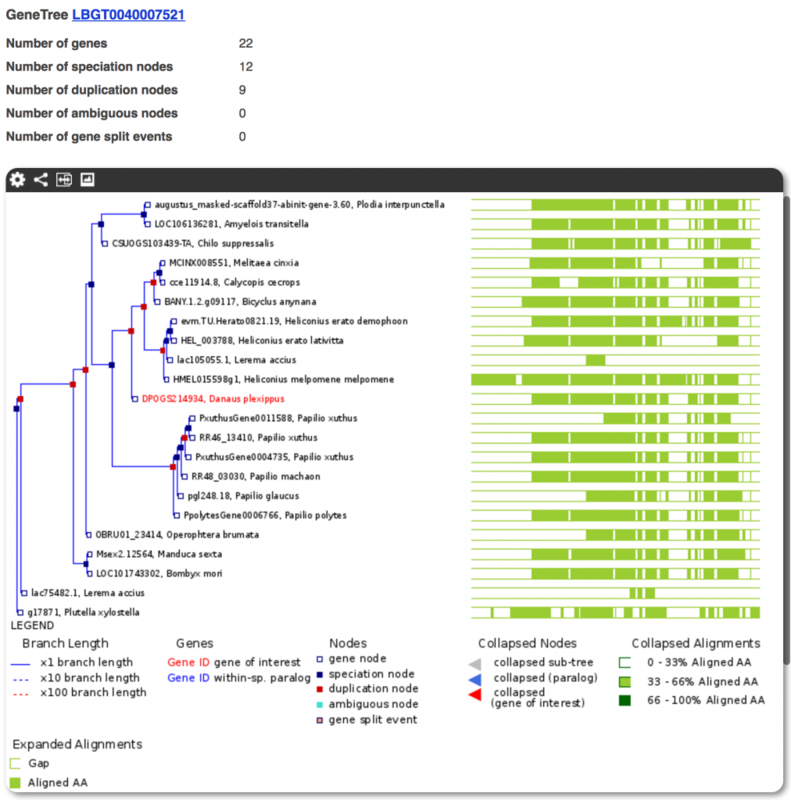 All genome sequences were masked using RepeatMasker 4.0.6 with the built-in arthropod repeat database. Previous Lepbase releases used RepeatModeler to generate species-specific repeat libraries. However, we found that RepeatModeler risks masking recently expanded gene families, therefore we took a more conservative approach and did not use RepeatModeler for this v4 release. We also provide functional annotations for protein-coding genes in all species with gene models using BLASTP against the SwissProt database, and using all the tools provided by InterProScan. Lepbase.org previously ran on Linux virtual machines because of the complex dependencies of the various software programs involved. For Lepbase release v4, we have successfully migrated all the services, including the import and annotation pipelines for new genomes, to a Docker-based container infrastructure. None of this affects how the service looks to the outside world, but it makes it much easier for us to upgrade the software as new versions of Ensembl and other software are released. We will also be able to easily scale up individual services to meet the growing number of users. Although all our code is public already (see github.org/lepbase and easy-import.readme.io), we plan to document it extensively in the coming weeks, so that other groups can rapidly and easily set up their own taxon-specific Ensembl-based genome hubs using our Docker infrastructure.